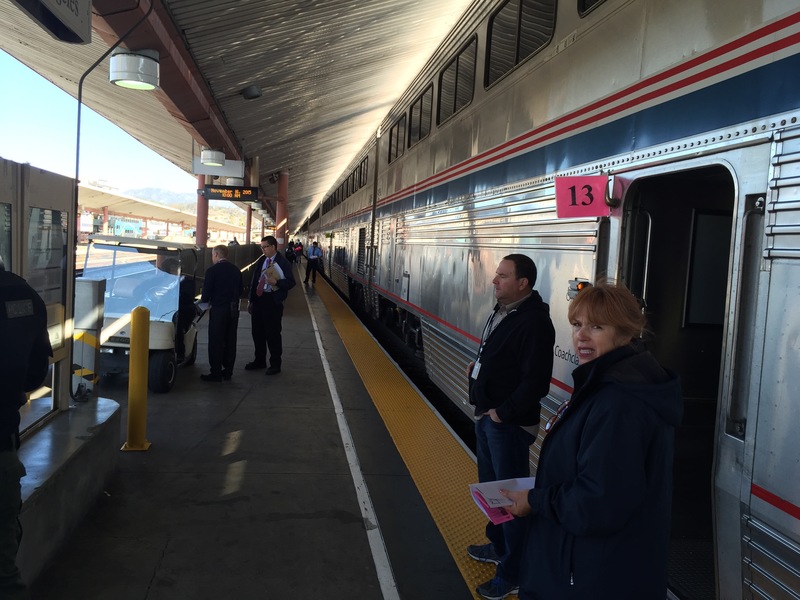 I decided to leapfrog the fierce Central CA headwinds this time of year and take Amtrak to the Bay Area Monday. This part of my tour will demonstrate how well a folding bike can work for multi-modal travel. 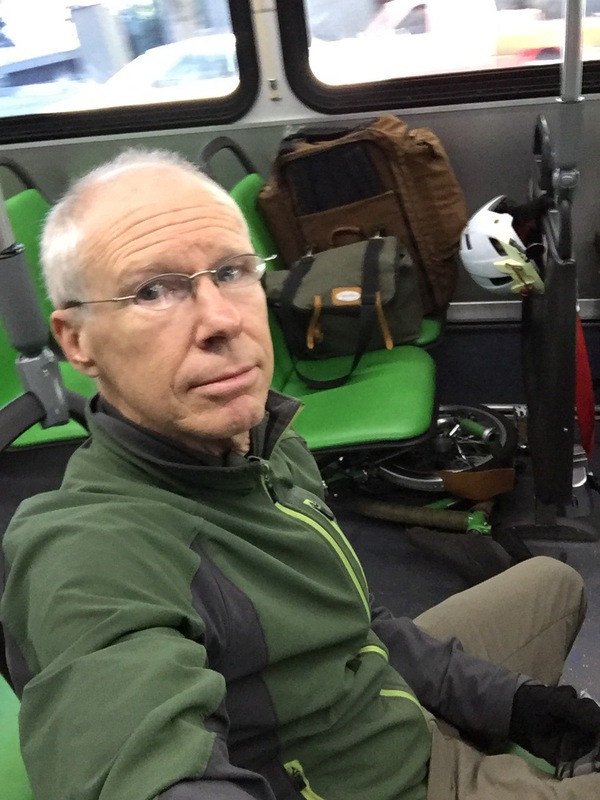 I jumped on the #10 Big Blue Bus (above) with my gear to get Downtown. Bike goes under the seat, no worries about the rack on front being full. …and onto the train platform. 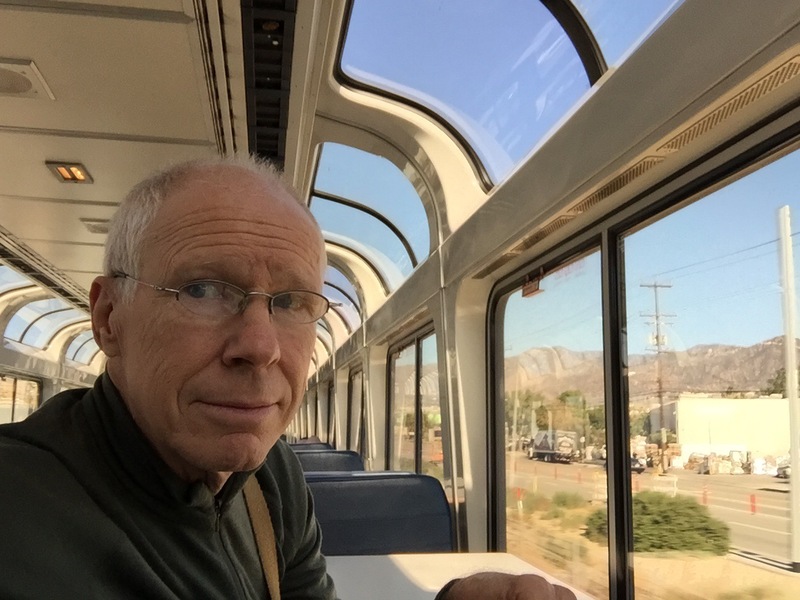 If I had a full-sized bike I’d have had to box it and send it as checked baggage on the Coast Starlight train (Pacific Surfliner allows bikes to roll on but it only goes to San Luis Obispo). With my folding bike I just bring it on board and put it in the luggage area of my car. Then I relax for a very civilized journey up the coast. 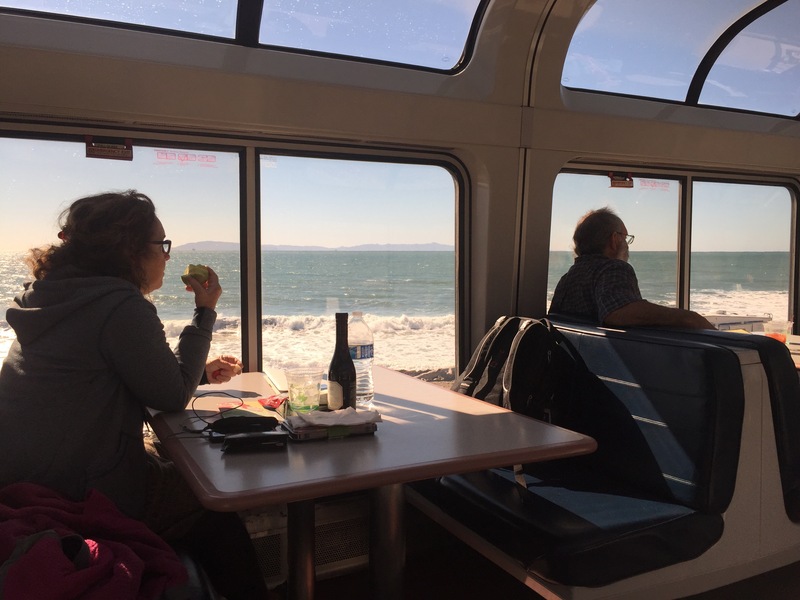 Chatting with fellow travelers can make train travel a very social experience. This woman runs a whale watching tour out of Santa Cruz. 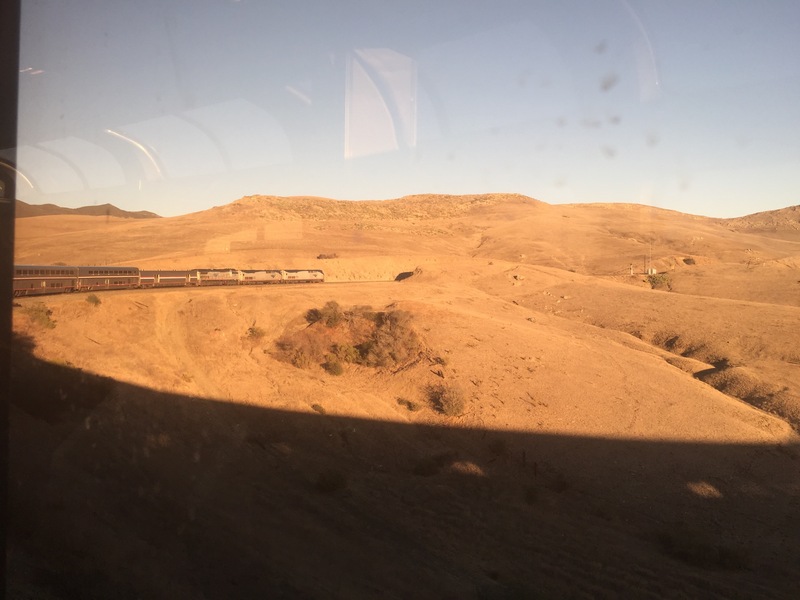 We get a rare view of the front of our train as we climb inland east of San Luis Obispo. Hwy 101 and the Cuesta Grade come into view, above. As I was enjoying this lovely sunset vista I was startled to see what looked like so many dead oak trees on the hillsides. Look closely: over half the trees are brown. If this is tree die-off from the drought, it looks pretty serious. Gov. Brown has declared a tree emergency, calling this “the worst epidemic of tree mortality in modern history”. Among other things, he is encouraging utilities to accelerate contracts for bioenergy projects that can use forest products, presumably dead trees. Better to use them for fuel in a controlled combustion process than to see them burn in a wild fire. I got off the train in San Jose around 9:30PM and caught an express bus to Santa Cruz then rode my bike with luggage to my destination. That’s two bike rides, two bus rides and one train ride to get here. It all worked very smoothly. I’ll set off to San Francisco Wednesday with plans to visit the San Francisco Bicycle Coalition and Bicycle East Bay. Glad you’re enjoying civalized transport! Looking good. I love it when I can combine a train trip with my bike trip. That folding bike looks like the thing to have. Makes it so flexible for getting around via multiple transportation modes. Enjoying the pix! Hi, Kent. This is from Greg, one of your dinner companions on Monday night. It was good to meet you and good luck with the tour. I’m glad the rest of your trip to Santa Cruz came off well. I went for a walk yesterday morning in Oakland and saw an office in Jack London Square for an East Bay bike-as-transportation organization. It will be fun to read about the rest of your tour in northern California. 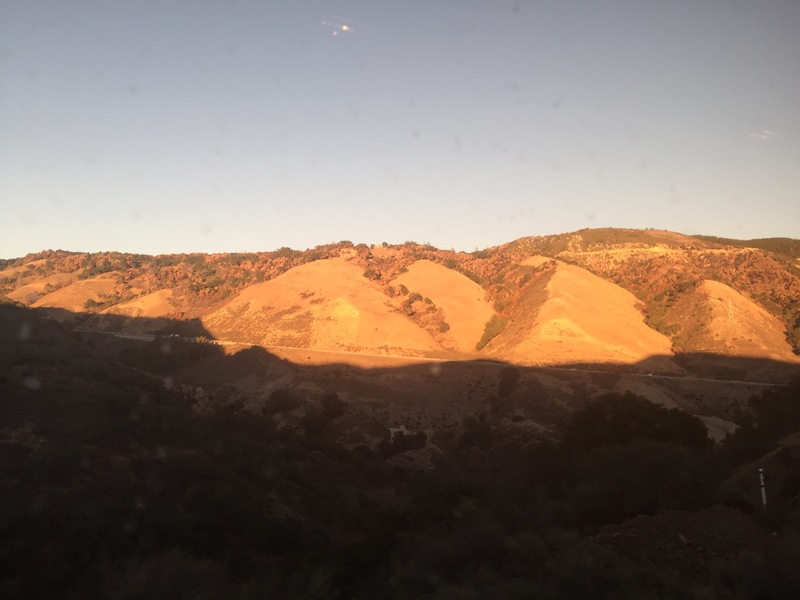 By the way I took a couple of pictures on the coast between Santa Barbara and San Luis Obispo you’re welcome to use in this post if you’d like. Thanks for getting in touch. 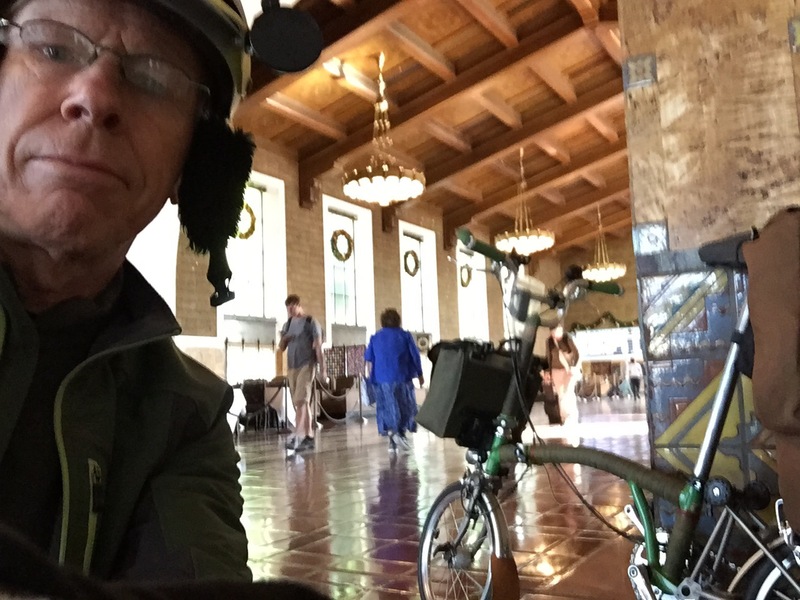 In fact I’m going to visit the folks at Bike East Bay this afternoon, at Jack London Square. I would be interested in seeing the pix you shot and maybe adding them to my blog as I didn’t shoot enough on the train. You can send them to my email. Thanks! I just figured out you switched to the Brompton; I couldn’t figure out how you quickly folded the bike Friday. Yes, the Brompton works better for multi-modal journeys as it folds much faster than the Bike Friday and gets smaller, so easier to find a place to store it on trains and buses. The Bike Friday is superior for loaded touring though: more luggage capacity, wider range gears, more comfortable riding position. say… I put things off a lot and never seem to get nearly anything done.